Recently SolidBox had the opportunity to be a part of a great project in helping a Certified SOLIDWORKS Power User in need. Dave Bear lives in Australia and is a very active member of the SOLIDWORKS forum. He recently underwent brain surgery and has been without a SOLIDWORKS-capable laptop. His friend Todd Blacksher, leader of the SOLIDWORKS User Group of Nebraska, organized a fundraiser to get Dave a SolidBox. Dave’s office in the Australian outback. Dave originally began using SOLIDWORKS because of his brain condition. His doctors told him that it would be a few years before he could undergo the necessary surgery. They recommended that he find a hobby that would challenge him and keep his brain as active as possible. A friend of his suggested he learn SOLIDWORKS and lent him a laptop that had SOLIDWORKS loaded on it. Dave started out by going through all of the tutorials that are built into SOLIDWORKS and watching YouTube videos. He also joined the SOLIDWORKS forums. At first, he was asking tons of questions. Before long, though, he became proficient enough that he was answering a lot of questions. That’s how Todd and Dave came to know each other. 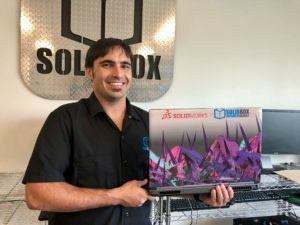 In July, Dave announced to the entire SOLIDWORKS forum that he was about to go under the knife and was also required to return the computer he had been borrowing. There was an outpouring of support for him regarding not only the surgery, but also his loss of access to SOLIDWORKS. Once the forum had gotten word that Dave had come out of the surgery just fine, they mobilized to get Dave a SOLIDWORKS license and a SOLIDWORKS-capable laptop to run it on. Around this time, I was working on the “Map of Support” to show Dave that people from all over the world were pulling for him. I thought, “Hey, if each of those people could kick in $20, we might be able to get a laptop for Dave!” Initially I wasn’t thinking anything fancy, just something that could run SOLIDWORKS pretty well. So I bounced the idea off a few people and it seemed like something that might fly. Then I hit up Chris Castle to see if SOLIDBOX would be interested in helping out. There was no pause, just an “Absolutely!” We all know Chris is pretty awesome like that! I set up a PayPal pool and started sharing the info with people that had dropped pins on the World Map as well as people that had participated in some of the other “Dave Discussions,” as well as everyone I follow on the forums, all the User Group Leaders, and so on. While the PayPal Pool was running, I hit up 3Dconnexion and asked if they would be interested in helping our cause—which they did! I stayed in close contact with the people at SOLIDWORKS corporate, checking on the licensing, seeing if they would be able to ship to Australia for us, and basically keeping them in the loop with what was happening. One of the forum regulars (Matt Peneguy) suggested the laptop skin. John Stoltzfus (a close friend of Dave’s) provided the artwork for it which he created in SOLIDWORKS. Everything fell into place and I think that we call came together to give someone the gift of a lifetime. Dave’s custom SolidBox laptop with a skin designed by a fellow SOLIDWORKS forum member. Previous Previous post: SolidBox Laptops — Now With 50% More Cores! Next Next post: Why do I need a CAD Workstation for SOLIDWORKS?